Note: This is the bound book only and does not include access to the Enhanced Pearson eText. To order the Enhanced Pearson eText packaged with a bound book, use ISBN 013383087X. 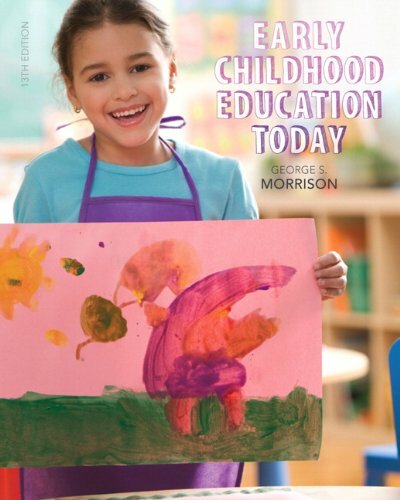 George Morrison’s goal in creating the Thirteenth Edition of Early Childhood Education Today was to collect the most current, researched-based information available on providing the high-quality early education all children need to be successful in school and in life. The new edition integrates thirteen critical themes that are foundational to the field today: the importance of children’s literacy development, teaching in increasingly diverse classrooms, applying developmentally appropriate practice, closing the achievement gaps between children in poverty and those that are more economically advantaged, integrating special education and early childhood education, teaching in an inclusive classroom, closing school readiness gaps, meeting the challenges of teacher accountability, integrating STEM subjects into the curriculum, providing for children’s mental health, using technology to support learners, developing as a professional, and guiding children’s behavior to promote personal responsibility. The new edition retains the engaging style that has made the book so popular and provides practical examples of authentic teaching practices used by master teachers around the country. Its strong coverage of development in the age-specific chapters and its emphasis on diversity make it the leading book in the field. The Enhanced Pearson eText features embedded video, video analysis exercises, and assessments. *The EnhancedeTextfeatures are only available in the PearsoneText format. They are not available in third-partyeTextsor downloads.